Ready to sort out the facts from the fantasy of the Shamrock Legend? Sure, you already know a wee bit about the shamrock legends. I've found that many sites tell you the same basic things, in the same three paragraphs, word-for-word. But I know you want to know more. I know you're tired of reading the same words about St. Patrick and shamrocks over and over again. Well, you came to the right place! How do I know? Because even though I won't leave out the basics you find everywhere else, I can relate that basic information to you in my own words, and I can (and will) reveal even more about the shamrock legend than you will find anywhere else. You are about to discover that Fantasy-Ireland is the only source you need for learning about all your favorite Irish symbols! Why? Because the shamrock is one of the best representations of the Fantasy Ireland! And it is my job to honor your fantasy of Ireland, but also to help you sort out fact from fantasy. You count on me to honor your fantasies, but also give to you the facts. So you can decide for yourself what the shamrock legend means to you. Contrary to popular belief, the shamrock is not the official emblem of Ireland. Ask any head of state or diplomat. Officially, that honor goes to the Celtic harp. But in the hearts and minds of people all over the world, the shamrock is the symbol of Ireland. You could say the shamrock is the emblem of Irish culture. After all, the shamrock is without a doubt the most universally recognized symbol of Ireland. It has such power to define Ireland in the minds of people that it is used in the official logos of many major Irish organizations, like Fáilte Ireland, the Irish Tourist Board, for example. It is also the emblem of the official airline of Ireland, Aer Lingus. Every year on St. Patrick's Day, Aer Lingus flies freshly cut shamrock to the Irish embassies all over the world so that Irish diplomats and uniformed personnel can uphold the "Wearing of the Green" tradition on their beloved National Holiday. Many sites will tell you that the little trefoil known as the shamrock was once known as "seamróg", pronounced "Seamroy", meaning "little clover". They also mention the fact that it is a very common clover that grows heartily in Ireland. Many agree that the ancient Druids honored it as a sacred plant. The Druids believed the shamrock had the power to avert evil spirits. Some people still believe the shamrock has mystical, even prophetic, powers. It is said that the leaves of shamrocks turn upright whenever a storm is coming. 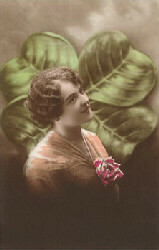 According to Lady Wilde, the shamrock "enlightens the brain and makes one see and know the truth". The ancient Irish Celts also revered the shamrock because it has three leaves, and they considered "3" to be a sacred number. The ancient Celtic Druids believed many numbers held mystical powers. The three leaves shaped like hearts were associated with the Triple Goddess of Celtic mythology, otherwise known as the "Three Morgans". The Triple Goddess represented the Triple Mothers, the hearts of the ancient Celtic tribes. This Celtic tradition of honoring "3's" continued in Ireland for millennia. Three was also sacred to devotees of the goddess, Brighid, signifying totality. And the Irish bards continued the significance of "3's" by using triple repetition in their storytelling rhythms. Actually, many spiritual belief systems, ancient and contemporary, find the number "3" to have mystical properties. The shamrock was considered a sacred plant to ancient Iranians, for example. They knew it as "shamrakh" and honored it as a symbol of the Sacred 3's. The shamrock is a symbol of the Trinity and the Cross for most Irish-Catholics. This is due to the most famous shamrock legend, starring St. Patrick. The story basically says that he used the shamrock to help the pagan Druid High Priests and their followers comprehend the Holy Trinity: Father, Son, and Holy Spirit - All in One Almighty God. But we know the shamrock was already considered a sacred plant to the Druids long before St. Patrick arrived in Ireland. Perhaps that is why, according to the shamrock legend, he chose this common little clover to illustrate the Trinity concept to them. The wisdom of St. Patrick's mission was to take ancient pagan Celtic ideas and beliefs and use them to explain the concepts of Christianity in such a way that the Druids and their followers would embrace Christ and the Trinity. "Do you not see how in this wildflower three leaves are united on one stalk, and will you then believe that there are indeed three persons and yet one God?" According to Irish folklore, this effective demonstration secured the approval of the Druid High Priests of St. Patrick's missionary work in Ireland, and even led many of them to convert to Christianity and become Bishops themselves. The shamrock legend also includes the story that St. Patrick drove all the snakes out of Ireland forever. The legend goes on to say that St. Patrick filled the Emerald Isle with lush shamrock fields to keep the snakes from ever returning. In fact, people say that shamrocks would grow wherever St. Patrick had preached. It is true that you won't find any snakes in Ireland. Believers in Irish folklore take this as proof that St. Patrick indeed did banish all the serpents from the Emerald Isle. This shamrock legend is validated to some by the fact that snakes are never seen in fields of shamrocks anywhere in the world, and that shamrocks can indeed be used as a remedy for snake venom. The question is whether or not they were ever there at all. Some scholars believe that there have never been snakes in Ireland. The more romantic folk believe St. Patrick really did perform a Divine miracle and drove them out. Actually most people these days realize that the shamrock legend is probably just a metaphor for the fact that he did indeed drive out the pagan beliefs and rituals, which are commonly associated with snakes. What "factaholics", as I like to call them, argue is that there is no mention of shamrocks in the writings of St. Patrick or his missionaries as a teaching tool. One would think that if it was such an important tool, and if it had the major impact on their mission like the shamrock legend says, they would have written about it. Alas, they did not. But the shamrock is, in fact, a symbol found on many medieval bishops' tombs, including St. Patrick's. It is also found on the copper coins that were once known as "St. Patrick’s money". So maybe there is a wee bit of history behind the legend. The facts are clear, though, that it wasn't until 1571 that anyone made written reference to shamrocks, some 1000 years after St. Patrick. In 1681 it is first mentioned as the badge to be worn on St. Patrick's Feast Day. "Seamróg", the Gaelic word for shamrock, is not found in writing until even later, in 1707. As far as it being a symbol of the Trinity, this part of the shamrock legend isn't included in any written records until 1727.
a powerful and universal symbol of Ireland? Well, for starters, during the days of Queen Victoria, the shamrock became a symbol of rebellion against the oppression of the Crown, when the Queen made it a capital crime to wear the shamrock on military uniforms, punishable by death. It was during this time that displaying the shamrock proudly on one's clothing became known as the "Wearing of the Green". Throughout the 19th century, the shamrock was used as a decorative symbol on everything Irish from churches and other public buildings, to clothing and household furniture. It wasn't long before anything connected with Ireland at all displayed shamrocks in some way. So the shamrock legend had taken on new meaning to Irish people. It went beyond being a spiritual symbol and became a source of empowerment and national pride. This empowerment in the 19th century made way for a "Celtic Revival", when Celtic art experienced an explosion in popularity. Between the oppressive rule of the Crown, the devastating and tragic Famine, and the growing tide of freedom-fighters, the Irish people sought to reassert their national identity and proudly display their Celtic heritage. 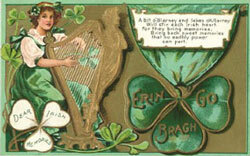 The shamrock and Celtic knotwork were commonly used together as a symbol of this pride. So when you read all about the shamrock legend, you wonder, "which is fact and which is fantasy"? The fact is, we'll never know for sure. But the fantasy inherent in the shamrock legend is precisely what gives it such power. After all, it's not necessarily facts that define real truth. It's what people believe that defines their truth, and that is what has the power to influence people’s lives. So, whether the shamrock legends are factually accurate misses the point. The shamrock legend has the power to comfort and inspire. So the legend will no doubt live on for quite some time, as it should. To learn more about the shamrock legend, read Shamrocks, Harps and Shillelaghs: The Story of the St. Patrick's Day Symbols. This little treasure is an invaluable resource for understanding the symbols associated with St. Patrick's Day. It was written by the late Edna Barth, the recognized expert in explaining the history and legends behind popular holidays to children. "Shamrocks" is not only thoroughly researched and well-written, but it has a way of blending fanciful stories and historical facts in such a way that it's easy for the wee ones to understand the significance of those symbols that they busy themselves crafting in preparation for St. Patrick's Day. Her book covers everything from the life of St. Patrick to the shamrock legend with insight and wit. For the teachers and parents out there, she includes a list at the end of the book that recommends more books to read to young students looking forward to March 17.